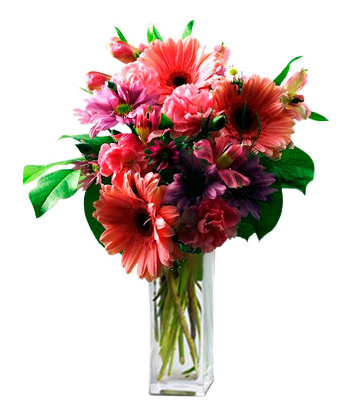 A gorgeous arrangement of Gerbera Daisies, Chrysanthemums, Alstroemeria and greenery. Check out this wonderful creation that's sweeter than candy. 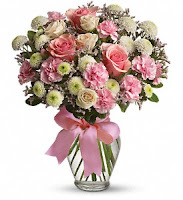 Features Pink roses, spray roses and miniature carnations, accented by some White Button Spray Chrysanthemums and Lavender Limonium, finished off with some greenery. 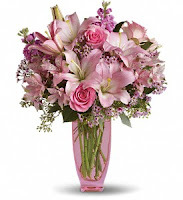 This bouquet lives up to its name, with tones of pink and lavender making it a favourite. 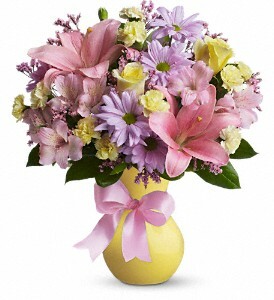 Pink Asiatic Lilies, Limonium and Alstroemeria compliment some lavennder Daisy Spray Chrysanthemums. Light yellow Roses and Mini Carnations provide some contrast. This bouquet features fresh cut roses, Asiatic Lilies, Snapdragons, Waxflower and classic Carnations. Sure to put a smile on the face of the recipient. 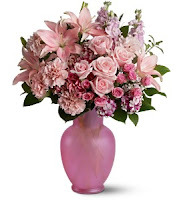 This dazzling arrangement features varying tones of pink, with Asiatic Lilies, lighter Alstroemeria and Pink Roses, topped off with White Waxflower and greenery. 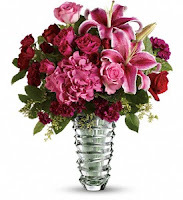 This is a wonderful bouquet for any occasion. 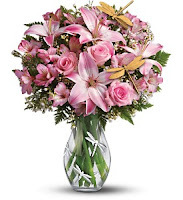 With Pretty in Pink, you'll receive pink roses, waxflower, Asiatic Lilies, Alstroemeria and lavender stock, with with seeded Eucalyptus to tie the look together. 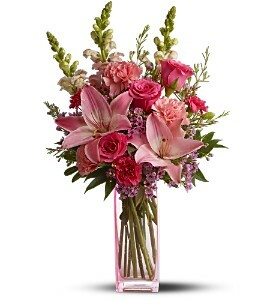 Roses, Asiatic lilies, Sweet William and Carnations work together beautifully for a pure pink look. A stunning bouquet that's as fragrant as it is beautiful. When nothing else will do, go with our Swept Away bouquet. Measuring close to 2 ft. in height, this bouquet comes loaded with red and pink roses, red and pink spray roses, pink oriental lilies, with purple carnations and mini carns to provide a slight bit of contrast. A brilliant arrangement that's consistently popular with Bloomex customers.